miniDSP introduces the DDRC-24, the world’s smallest Dirac Live® hardware processor. Dirac Live®, the world’s premier room correction solution, is now available in an unbelievably compact hardware unit. Powered by a 400 MHz Analog Devices SHARC processor, the DDRC-24 retains the 4-channel output of its sister unit, the miniDSP 2x4 Hd, in order to allow applications like subwoofer integration or even 2-way loudspeakers together with Dirac Live® room correction in a single tiny hardware platform. The matrix mixer and crossover functionality is accessed and programmed with miniDSP’s easy-to-use interface software. An all in one unit with USB DAC + Dirac Live Room Correction + Speaker processing. I/O capabilities get an upgrade too, with the addition of USB audio streaming up to 192 kHz and a TOSLINK digital input. 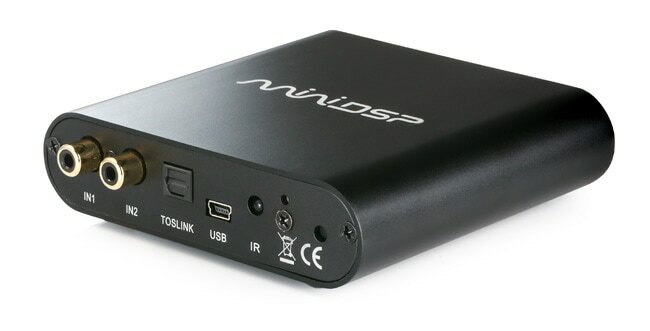 The miniDSP DDRC-24 will find application in full-sized hifi and home theater systems, on desktops, in cars, in recording studios anywhere a compact, powerful room correction processor is needed. IMPORTANT NOTE: A UMIK-1 is not included in the default price, make sure to select one as an option since 1x UMIK-1 is required for performing acoustic measurements when using the Dirac Live software. WI-DG for Wifi/Alexa voice control of your unit. Note only the plugin is controllable via Wifi. Dirac Live still requires a USB connection unfortunately. The miniDSP DDRC-24 includes not only Dirac Live® but also a full set of crossover functions on its four output channels. One use of this is as a flexible tool for integrating subwoofers into your system along with Dirac Live. This application will show you how to build a 2.1 setup. In this application note, we show you how to use Room EQ Wizard (REW) and its integration with miniDSP to equalize your subwoofer.